Federal Polytechnic, Oko Anambra State ND and HND Morning Programme Tuition/School Fees Schedule for Freshers/Newly Admitted Students for 2018/2019 Academic Session. Authorities of the Federal Polytechnic, Oko Anambra State has released the tuition/school fees schedule for freshers/newly admitted ND and HND Morning students for 2018/2019 Academic Session. All Students who has been admitted are to proceed with the below fees breakdown for the current academic session. (1) Every new student will pay N15,150.00 acceptance fee. (2) Every student living in the hostel will separately pay N10, 000.00 hostel upkeep fee. (3) All students will pay National Health Insurance Premium of N1, 600.00 to the Medical Centre. 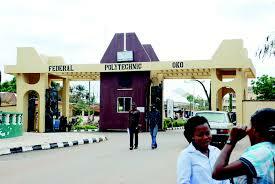 (4) All newly admitted students must pay N2,000.00 for biometric ID card.